Yet even recognizing corporate intellectual-property imperatives, a sympathetic reader must still avoid close scrutiny of Batman's motives and methods. This genius psychologist and criminologist, who has repeatedly out-thought every other superhero in the DC Universe, still can't get past the decades-old trauma of his parents' murder. And though he could neutralize most opponents harmlessly, he instead terrifies and assaults them. Does this approach work, even in the comics? Seems like all it does, best-case, is drive the crooks out of Gotham, offloading the crime problem onto other cities. Still, we accept all this because we want Batman to be obsessive and sadistic. The unthinkable thought, though - the damning observation - is his choice of targets. When he's not foiling some super-villain's plot to turn everyone in Gotham bright blue, Batman fights muggers, hit men, drug gangs - minor-league hoods all - and the occasional crimelord. This is small-scale retail crimefighting, penny-ante stuff. Why no Wall Street derivatives traders? Directors of tobacco companies? Corrupt Treasury officials? Fraudulent researchers for Big Pharma or the chemicals industry? These individuals create misery on a scale the Joker has never imagined. Trouble is, these villains represent, or serve, multinational corporations - and Batman is wholly owned by the world's largest entertainment conglomerate, Time Warner, Inc. 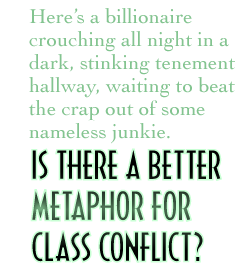 Here's a billionaire crouching all night in a dark, stinking tenement hallway, waiting to beat the crap out of some nameless junkie. Is there a better metaphor for class conflict? In that war, make no mistake: Batman works for the other side. Let's not think about it, though. After all, there's plenty of other comic absurdities to ponder. For example, if Wonder Woman has a villain in her magic lasso so he's compelled to speak truth, why doesn't she interrogate him about other villains' plans? If Zatanna casts magic by speaking her spells backwards, are guys named Bob and Otto immune? And the Flash - don't get me started on the Flash! While reading way too many comics, game designer Allen Varney has found time to write over 60 articles for The Escapist.